SGHS National Honor Society students stand with the food they collected to give to six families this Christmas Season. The students were also participating in pajama day on Monday. 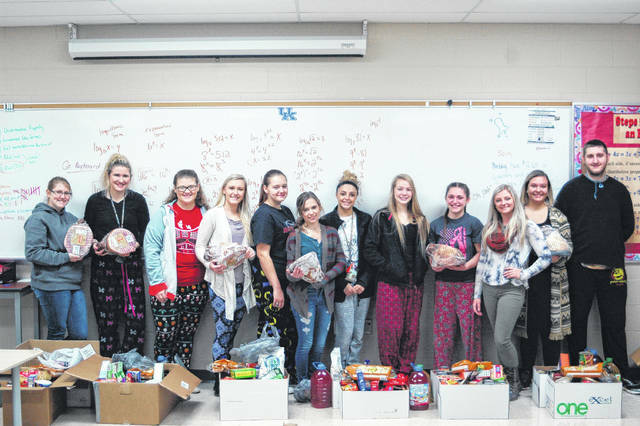 MERCERVILLE — South Gallia students completed a food drive to provide six families with a Christmas dinner this year. The National Honor Society organized a competition between the four grades in the high school to raise money to fund the donations. Students brought in money and canned foods, which counted in a scored system for their class. Canned food and pennies earned a point, while dollars and silver coins lost a point. Students could donate dollars and silver coins to the other classes to lower their opponents scores. The freshman took home first place, earning a movie and popcorn while at school. The money raised went towards purchasing additional food to give away to the families, including hams, stuffing, mashed potatoes, and other items. Riley Sanders, NHS member, explained that this is the second year for the food drive, raising more money than last year. This year students raised over 200 dollars for the food drive, all of it going to purchasing food. “You want to give for the Christmas season, and National Honor Society is about achievement, and we achieved our goal of giving six boxes away,” said Sanders. The drive was a student led event, with Sanders and Allorah O’Dell going out to purchase the extra food. Everything else was brought in by students. According to NHS advisor Karen Waugh, all six families are in the county school district.